A lightweight, quiet dryer that utilizes ceramic technology, negative ions, far infrared, low EMF and the new Nano Silver Technology to sterilize bacteria. A built in dryer stand lets you style hands free. Features a quiet speed motor, Nano Silver Grip, 3 speed settings and locking cool shot button. Try a CHI Nano Silver Hair Dryer from Farouk Systems and you will see what all the buzz is about! Ion Technology for Shinier Hair. Locking cool shot button - press once for on and once for off. You don’t have to hold it in. Very convenient for styling. Where can I get a concentrator attachment for my blue nano? Where can I get the correct black concentrator attachment for my blue nano dryer and a diffuser to fit? The black concentrator I have seems to be too large for the blue nano dryer barrel but fits on the red dryer by snapping on the end of the barrel. Thank you. Bought this dryer a year ago and now I regret buying it. It gets too hot and makes my hair puffy. And it's large and heavy. Not worth the money at all. I hesitated to buy this dryer because of the high price, but once I got it home, I realized that I would pay $ 300 for it. My hair looks like I just came from the salon. This CHI blue dryer is amazing! It smooths my hair unlike any hairdryer I've ever had. It looks like I just came out from the salon. Love, love it! I did a lot of research on the web prior to making my purchase. It turned out my best investment this year! I absolutely love it! My hair has never looked so healthy, been so straight and felt so smooth! I would highly recommend it to anyone. Very light, very handy, and dries hair fast but won't burn or damage hair. Love it! "The Best Overall The Rest"
Posted Tue, Oct 5th, 2010 by Sherry B. So happy to get this chi nano ceramic hairdryer! It's very professional with lots of air and heat but quiet enough. Dry my hair fast.lol. CHI Ionic Hair Dryer, Love it! I used to feel tired to dry my long hair with my old hair dryer, it always took at least 15 minutes to finish. 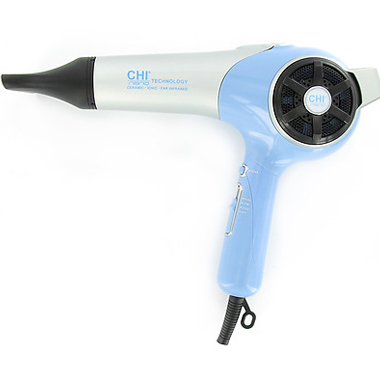 It stopped blowing at last and I bought this blue CHI ionic hair dryer. Fortunately it doesn't let me down, it blows so fast and always finishes drying within 7 minutes, it's so easy for it to get the work done and the hair become very smooth, I love it! I have used many hair dryers in the past 15 years, but this one is the fastest that makes the drying easy, 10minutes for my long hair! It's absolutely awesome, and I am glad to say, CHI is good! Anyway, I still wanna suggest, it's better not to let it blow thermal air all the time, but cool air at the end. Then you would enjoy the sheeny finish. I gave my Sedu xti hair dryer to my sister, coz it's too large(heavy) for me. I got this CHI hair dryer last month. It's much lightweight than the previous Sedu Xti, yes, that makes me so comfortable using it. and it dries my hair fast and sleek. I really love my CHI hair dryer.